Satellite image courtesy of DigitalGlobe, Inc. 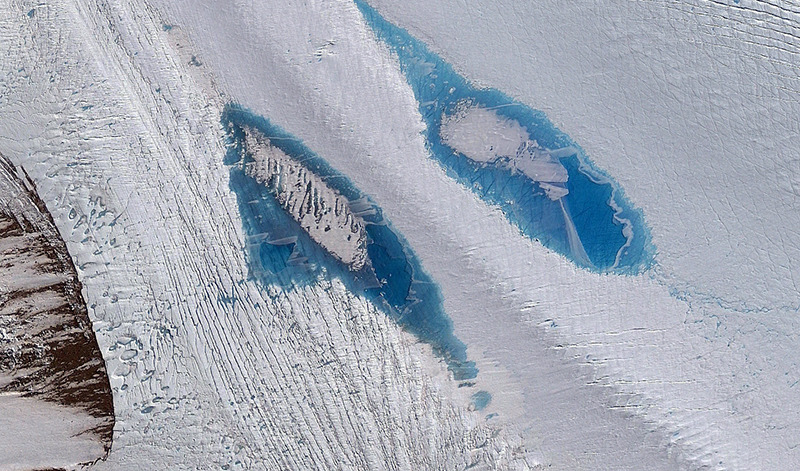 The team, which included glaciologists Professor Chris Stokes and Dr Stewart Jamieson from Durham, and Dr Amber Leeson from Lancaster University, used satellite observations at Langhovde Glacier to demonstrate the development of meltwater-related features, such as ponds and rivers, which have been common over the last decade and a half. During a short summer period, air temperatures rise just above zero, allowing melting to occur, ponds to form, and rivers to develop, with the largest and deepest lakes occurring consistently when the temperatures are warmest. These lakes have been found up to 18.1km inland from the grounding line and meet their demise either by draining their contents into the ice beneath or by quickly freezing over at the end of the summer. In Greenland, similar - but more pervasive - lake formation has been found to affect the flow of the ice sheet. However, in East Antarctica, the impact that lakes have upon ice flow, ice loss and sea level change has not been considered until now. We predict that as the climate warms, these surface lakes in East Antarctica will become an important control over the fate of the ice sheet, as we have observed in Greenland over the last 3 decades.